Betties back! And shes right where she belongs: in all kinds of trouble! This time, its a low-budget time machine that mistakenly transports her to ancient Egypt where she battles the High Priest of Amon Ra, assorted thugs, and a lovesick mummy twice her size. She wiggles and squirms, and even bumps and grinds, to avoid their evil clutches, but she cant avoid the inevitable: everyone falls in love with her, she loses her clothes (frequently), and gets she thrown into a bottomless pit to be buried alive. 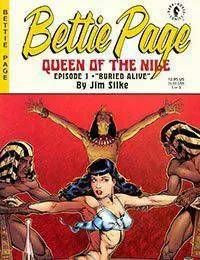 Jim Silke continues the story he began in Bettie Page: Spicy Adventures, with Dave Stevens as cover artist.